You love your screen, but don’t love how easily it gets damaged. Ed’s Window Screen Repair provides a product that’s everything you appreciate about screens without the fragility. Ask us about one that’s weather resistant in Frederick, MD, and we’ll set you up with a screen that doesn’t lose its value thanks to holes from high winds. Whether your pet is scratching to come inside or to go outside, you can count on these screens to stay strong. Let us install a screen that’s better, affordable, and longer lasting. You’ll be prepared for anything. Our professionals use only the best parts and products for our custom quality window screens. Take advantage of our weekend hours for repairs and replacements with the guaranteed lowest prices in the area. Each job comes with a 30-day workmanship warranty to help you get the most you can out of our service. When you’re considering an investment in your home, reach out to us for on-site estimates. We promise honesty and accuracy on each estimate we offer. Ed’s crew members treat every job with the individual attention it deserves. There’s a much more satisfying and permanent solution to a screen full of holes than leaving it that way. We have the word “repair” in our name because that’s what we do—we fix up damaged screens and do it at a budget-friendly price. Our team routinely fixes problems caused by wind and pet scratches, which is why we recommend purchasing weather resistant screens to all of our clients. They still keep out the insects and let in the cool summer breeze while staying tough under pressure from pet claws and Mother Nature. 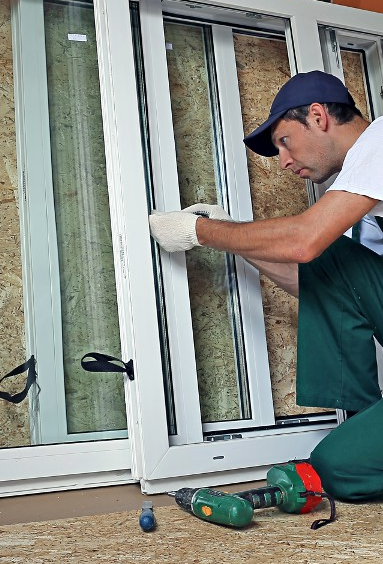 Whether your screen is just a way to keep your window open or it’s part of a sliding door, we can fix it up or replace it with its weather resistant counterpart. We do custom work on each, as no two windows or doors are alike. Fall is often the best time to schedule our service so you can store your screens for winter and avoid letting in those blizzards, but of course, we’re happy to help you at any time. Just give us a call or fill out our form here on the website, and we’ll get back to you as soon as possible. Contact us to experience the difference that weather resistance can make. We offer service throughout New Market and Montgomery County, Maryland, and the nearby communities.